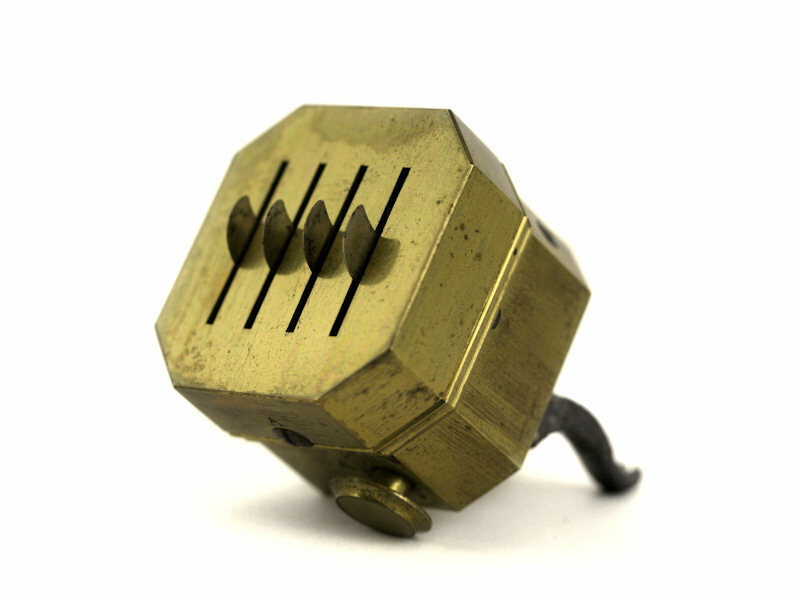 More sophisticated measures to bleed patients were developed and automated devices called scarificators became popular in the 19th century. These consisted of rows of between 4 and 16 sharp steel blades concealed within a brass casing. Cocking the lever primed the scarificator by rotating the blades through slits in the metal surface. The blades were then locked in place but remain under tension from the coiled steel spring. After placing the “cocked” device over the area to be bled, the button on the side was then pressed to deliver the blow. This would released the spring and turn the blades at speed back through 180 degrees, instantly causing multiple lacerations through the skin. The process was relatively humane and probably less painful than manual venepuncture. ‘Wet cupping’ (as opposed to ‘dry’) was the name given to a procedure of extracting blood into cups, which was often done with a scarificator. Other devices referred to as spring lancets were common in Europe and work on similar principle to the scarificator, but with a single blade.